This article focuses mainly on the technical issues of the possibility that warfare chemicals, WC, will be used in a new military conflict, one possibly initiated by N. Korea. WC such as nerve agents and mustard gas have recently been used in Iraq and Syria. Most recently they were used in Syria against civilian population. I want however to focus on two recent developments in the Korean Peninsula and their ramifications. These events are the firing of multiple missile by N. Korea and the killing of Mr. Kim Jong-nam in the airport in Kuala Lumpur, Malaysia, by agents of N. Korea, using the nerve agent VX. Although this was a targeted attack aimed to kill one specific person, it raises the possibility of a much more ominous dimension: Does N. Korea have or is developing a WC warhead that can be mounted on a missile?. Although the possibility of using a chemical warfare head is not new, it has been shelved by the USA, Russia and by other countries since the dawn of the cold war. Numerous agreements banning WC production, storage and use have been signed which quieted for a while additional activities in this area. Now, the preponderance of the facts suggest that it may be closer to becoming a reality. The threat that a warhead with WC or with radioactive materials, commonly known as “Dirty Head”, DH, cannot be set aside anymore as a very remote possibility. In addition, the possibility that Toxic Industrial Chemicals, TIC, will be mounted on a missile should also be kept in mind, but this use will not be discussed here. Reviewing the information disseminated by the news media relative to the attack on Mr. Kim Jong-nam in the Malaysian airport revels several critical facts. 1. N. Korea has nerve agents, notably VX. This fact is not surprising because making VX is a relatively simple, well-known process, which uses reasonably available chemicals. Never the less, making or storing it, let alone using it, are violations of many international treaties. 2. N. Korea will not hesitate using WC even in public places, to support its interests. 3. The airport in Malesia, and most likely all the other airports in the world, was woefully unequipped to detect and/or decontaminate WC. 4. The airport in Malesia, and most likely all the other airports in the world, are not equipped to investigate WC attacks. 5. The airport in Malesia, and most likely all the other airports in the world, are not capable or equipped to provide medical assistance in a case of a WC attack. The video of the incident in Malaysia shows a woman running in the airport for 5-12 seconds, presumably with the agent VX on her hands, putting the agent on Mr. Kim Jong-nam face, and running away from there. Seemingly, she entered the bathroom and cleaned here hands. Mr. Jong-nam died about 20 minutes later. The woman who smeared the VX on his face survived, seemingly with full capacities. This scenario is somewhat suspicious because VX is a persistent agent that is not soluble in water and in general cannot be cleaned easily. Hot water and soap can clean it, but not in a short rinse. The woman survived however with no easily detectable physiological damage. The photos show that the weight of Mr. Jong-num is about 100 Kg and that of the woman about 66 Kg. Assuming that toxicity rules such as those involving LD50, apply to nerve agents, one may use the following rational: If the woman and Mr. Jong-nam were reasonably healthy, then about 100/66=1.5 more VX will be required to kill Mr. Jong-nam than to kill the woman. Since Mr. Jong-nam died in about 20 minutes, the dose of VX that he absorbed must have been fairly “large”. The fact that the woman survived relatively intact, suggest that the woman did not have the VX on her hand directly, she must have carried the agent or its solution in a capsule, a small bottle or a spray bottle, which she used to smear the man’s face. The open media did not show any container that could have been used to carry the VX or any one that was found in the murder scene. Was one found and the info was not published? Had the woman carried the agent in her hands, she would have suffered from severe medical issues, if not death. Although experiments were conducted by the US Army in attempt to develop creams that were somewhat impermeable to WC, it is unlikely that such a cream was used by the woman. Acknowledging that the skin of the face is more permeable to agents than the skin of a hand, the difference is not sufficient to explain the fact that the man died quickly while the woman who smeared the material on his face survived with reasonable health. Since exposure to WC requires that medical treatment be provided VERY RAPIDLY, if the victims are to survive, it is essential that critical, vulnerable facilities, such as airports or major train or bus stations, will have at all times: A. Trained personnel who can quickly determine the nature of the problem, identify the WC or TIC used, cordon the accident area and provide at least a minimal medical attention to affected victims. B. Easy and intuitive WC detectors that can identify the WC or the TIC used, minimal emergency medical devices as needed to avert an immediate death and hardware to cordon the affected area, stop leaks, etc. C. A clear communication channel and protocol as needed to secure the help of local police and medical personnel, as needed to bring over rapidly additional help, and, D. Secure areas and triage areas should be identified and have in them some medical emergency hardware to allow safe management of crowds when a disaster happens. It should be noted that panic attacks around such events can result in injuries since many people try to escape the effected location. If the escaping people are contaminated with WC, they can spread the agent with them and increase the number of casualties and the difficulties of subsequent efforts to decontaminate the area. The personnel, hardware and protocols for securing rapid assistance must be available on-site and on-time at all times. Unfortunately, realistic constraints on funds, personnel and on-site space, restrict the availabilityof these means. Since WC terror and planned attacks are generally rare, public facilities managers have to constantly evaluate how much money, space and personnel should be allocated to preparation and readiness, as needed to address such events. Although it is expected that the recent events will swing the pendulum in the direction of allocating more resources to fight such eventualities, reality dictates that: A. Only minimal resources will be used in terms of hardware, space and personnel. B. Whatever hardware be selected, it has to be very small, very user friendly and intuitive to use as well as available and ready to use on a moment notice. These parameters are essential to guarantying that a long term effective solution be available that will meet the needs of the facility. Table #2 summarizes some of the available means and their advantages and disadvantages. Note that INSTRUMENTAL methods were NOT included in Table #2. The reasons for this are that the available instruments are not suitable for such an application because they are: a. Very expensive. b. They require trained personnel and repeated refreshing of the training. They are not easy to operate or be used by relatively untrained people. c. They require repeated maintenance, calibration and expensive spare parts. d. They require a relatively large volume for secure storage, and, e. They require a relatively long “wake up time” before they can be used reliably. Although the production of WC is relatively simple, the method and hardware used to disseminate it often determines the number of casualties. Most WC are NOT gases but liquids that have relatively low vapor pressure. For this reason, special hardware has been developed to disperse them as fine droplets or aerosol. Such aerosols can move in the direction of the wind or through the air conditioning ducts and continue to contaminate new places. The data in Table #1 show some of the properties of WC that are relevant to their application in a military action. Table #2 shows some practical aspects pertinent to being able to protect against an attack with WC. Militarization of WC typically involves using a device that disperses the liquid WC as an aerosol, i.e. a fine mist. Militarized WC may contain a thickening agent, a polymer that makes them more viscous and less amenable to solubilizing in water and soap. The function of the thickening agent agent is to facilitate the dispersion of the liquid and to make it stick better to skin and to other surfaces. In general, the thicker the agent is, more difficult it is to decontaminate it or clean it from skin. Aerosolized WC are removed rather efficiently by air filters such as ones with activated carbon filters. Such filters are not normally available in public facilities. Adding such filters to air conditioning lines should probably be considered in particular in very vulnerable facilities such as specific airports. The cost of the filters and their replacement should be considered in the decision-making process, even if existing ducts systems can accommodate the filters. The filtration efficiency declines in humid air. Adding effective air filters to existing or even to new facilities such as airports and subway will be very costly and maintaining them efficiently active may be too expensive. Figure #1 shows an example of a small, color-based detector for mustard gas, (HD). This card changes its color from off-white to turquoise when exposed to very small doses sulfur mustard, Lewisite, and their nitrogen analogue. https://www.chemsee.com/warefare-chemicals/. Figure #1: An Example of Very Compact, Color-Based Detector for Mustard Gas. 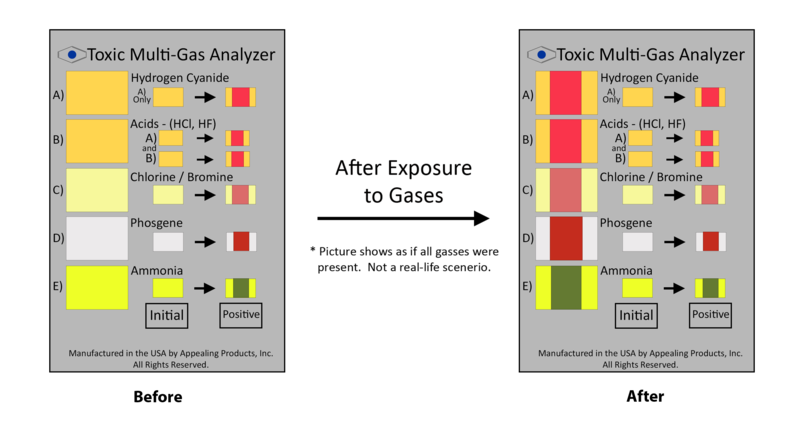 Figure #2 shows the RON™ detector, a compact color-based detector for several toxic industrial chemicals, TIC. This detector was developed by Appealing Products Inc., API, for detecting several common TIC that were used in Iraq and Syria to terrorize civilians. https://www.chemsee.com/gas-exposure-monitoring/multi-gas-detector/. Figure #2: API’s Very Compact, Color-Based Detector for Five Common Toxic Industrial Chemicals, TIC, Used by Terrorists in Iraq and Syria. 4 Contact us for details. 6 Start with warm water and mild soap and follow with hot water and harsh soap. Contact API for details. Note that cyanogen and hydrocyanic acid are NOT removed by common activated carbon filters but special filter materials are available that can remove them.